This course has been presented to more than 2000 electricians and engineers in the energy sector since 2015. Through access to PQRS data and market intelligence the Excel PV installer and designer course is more than just the average course. During the presentation consideration is given to what competitors are doing, costs per kWh, SLA’s and how EPC’s remain competitive. 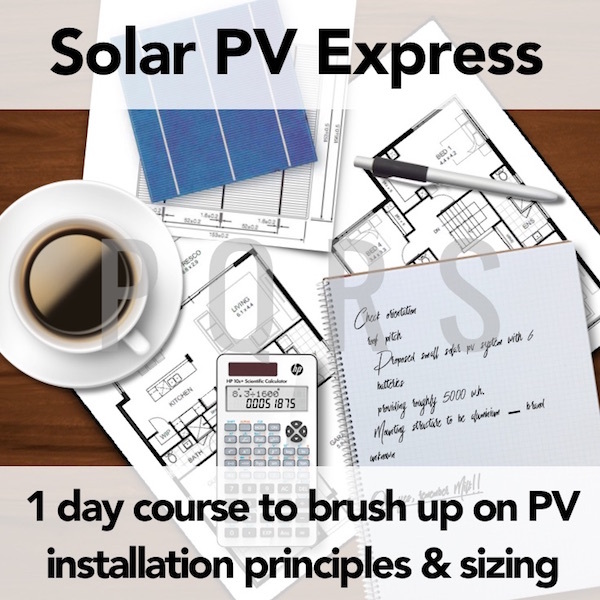 This 2 day solar PV design-and-install course was created to address the need for people, organisations or small businesses that require information on sizing, assessing and the installation of solar PV Systems and can afford to commit an extra day to attend the 2 day course. The content is ideal for experienced candidates, engineers and electricians as well as organisations thinking of approaching the RE sector. All 2-day courses contain practical elements depending on the venue and group size. i.e, testing voltage and short-circuit current of modules, doing experiments with shading and partial shading of modules. No formal pre-requisites are required in order to attend this course. Excitement about renewable energy and an eager mind will do. This course contains straight forward calculations, however a relative knowledge of electrical principles may be an added advantage. More detail of chapters are given elsewhere in this document and even more course structure detail can be provided on request down to 3-minute detail. After having attended this course, students should have a clear understanding of the fundamentals of a solar PV system, including various components, brands, and functions of equipment. Have a better understanding of the commercial market in SA. Differentiate or assess differences between what could potentially be good and poor quality equipment. Perform calculations relevant to the design of a system i.e. battery cost of energy equation, load calculation, power and energy calc, module string calculation, series and parallel calculation, temp co-efficient calc, volt drop, number of batteries required, nr of modules required. Experience the touch and feel of different components as various samples are made available, to pass around. As an added bonus, we explore market statistics and consider how data can be used to further business development. Interaction is promoted through continuous dialogue with questions and answers. 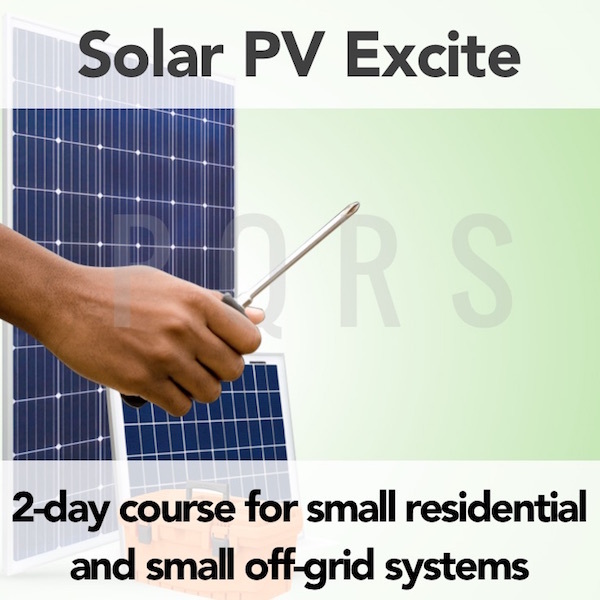 Solar PV Excite is a 2 day course and covers design and installation of solar PV systems in less detail. Solar PV Express is a 1 day course and covers the basics of design and installation of solar PV systems for candidates with limited time. Excel is a 2-day course and includes 8 x 90 minute sessions. 2 in the morning and 2 in the afternoon. Lunch is included in the cost of the course. Students receive a printed book with the slides. Books have sufficient space for taking notes. Courses are presented throughout SA, please enquire about when the next course will be presented in your region or take a look at our calender. Looking for an installer instead? Why not try a P4 contractor? All P4 contractors have already passed an online knowledge assessment with an 80% pass rate. List your installations at the PQRS directory at no charge.